It was a cool fall day. One of the first, after weeks of warm autumn days. I had been waiting for the perfect day to make a big pot of soup and homemade rolls and finally it was here! And so the search for the soup perfect recipe began. I found two recipes that looked pretty good, added my own touch and switched things up a bit, and came up with this delicious recipe for Chicken Tortellini Soup. Hope you enjoy it! 1. Put foil on a cookie sheet, add chicken (no need to thaw) and bake in 350 degree oven for 25-30 minutes (pre-cooked chicken can be used, too). 2. While the chicken is baking, chop onion, carrots, celery, and garlic as finely as you'd like. I chop my onions and garlic finely and keep my celery and carrots just a bit bigger. 3. Melt the butter and then saute cut up veggies in your soup kettle. Stay close by and stir frequently. 4. When the onion is translucent, add the chicken broth, water, and bouillon. Bring it to a boil. 5. 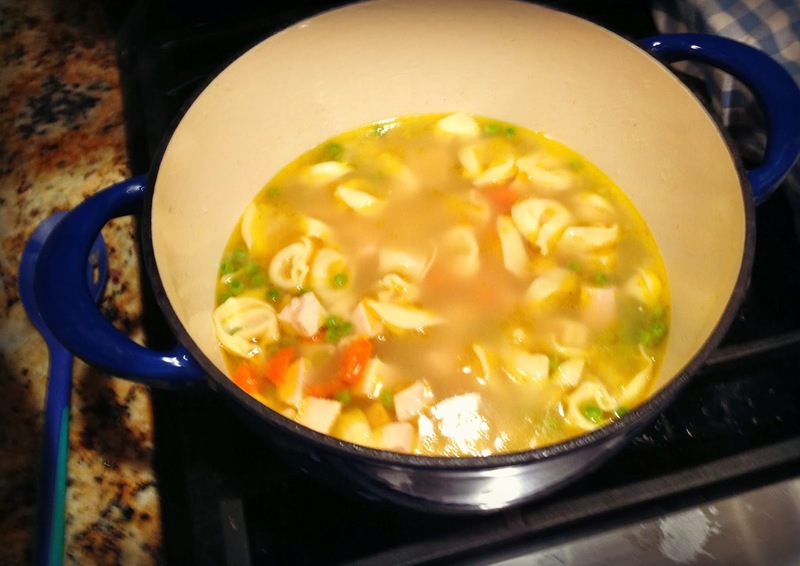 When the broth is boiling, add the tortellini and let cook for around 9 minutes. 6. Meanwhile, cut up chicken into small pieces and set aside. 7. When tortellini is almost done, add frozen peas, chicken, and Lawry's Seasoned Salt . 8. Simmer until peas are cooked and soup is hot. This looks very good! Especially on a cold fall evening! Thanks for sharing your recipe at the HomeAcre Hop!